The human shoulder joint is a very, very full ranging flexible joint, and this allows us to move our arms multi-directionally. This of course, is great for work, play, activities, function...but has a big downside: being so flexible and mobile decreases stability which increases the risk to injury. Most of the time, shoulder issues and problems are usually related to soft tissue damage caused by repetitive injuries or carrying heavy loads/forces on the shoulder. Shoulder pains can sometimes be very specific to one spot or location; but one may also experience it over a region/area...and in others it may radiate (travel) up or down the arm. This is a common condition especially in people who have very lax shoulder joints or people who participate in high impact contact sports (like rugby). When it happens, patients will experience a very sharp pain in the injured shoulder, and will almost always need medical intervention (on-field, clinic or hospital) to re-locate the shoulder joint. This condition is really common, as it happens over time with wear and tear. In 2011, there was more than 50 million patients in the United States treated for shoulder arthritis. Symptoms are pain and limited range of motion of the shoulder. 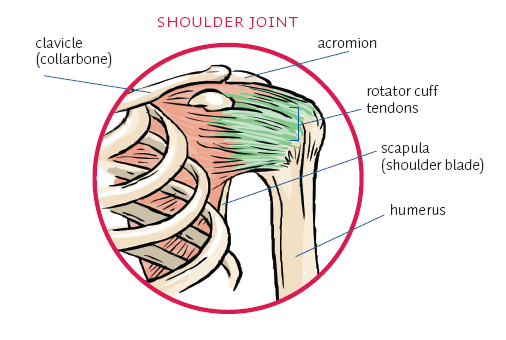 The rotator cuff is a group of muscles and tendons that surround the shoulder joint, keeping the head of your upper arm bone firmly within the shallow socket of the shoulder. Phoenix Rehab specialist senior physiotherapists are experienced and expertly trained to accurately diagnose, assess and treat your shoulder pain with very specific hands-on techniques for your shoulder pains. They may also use additional modalities such as ultrasound therapy, graded gradual strengthening, soft tissue management and a stretching program. ...collectively they are used to accelerate soft tissue healing/recovery, as well as with pain relief and as pre-cursor to stretching and range-of-motion stretching exercises. Of course, we also treat long term and chronic shoulder injuries effectively in our clinic. Here in Phoenix Rehab, we have a specially curated and selected team of experienced and passionate expert physiotherapists with years if not decades of experience and knowledge in managing shoulder injuries, shoulder rehabilitation and return to work/sports post shoulder injury. We are confident that they will be more than professional able to help you with your shoulder injury and overcome all restrictions and pains related to shoulder problems. They will begin with in-depth clinical assessment, history taking, palpation and special exercises and biomechanical testing; all in order to understand the severity of your shoulder pain and to trace the main issues of your shoulder pain. Then they will execute the shoulder pain physiotherapy interventions, which will include graded stretching and strengthening, ultrasound therapy for soft tissue healing and more.